It snowed a little bit on December 1, 1916, but that didn't stop the Lansing Gas Company trucks from picking up the 35 boys from the State Industrial School for their noon meal at the grill room of the Hotel Downey. The young men were treated to a lunch and other holiday festivities by the members of the newly organized Rotary Club of Lansing. Probably no one at that 1916 event ever imagined that it was just the first of many Rotary Christmas parties that would continue into the next century. A tradition had been born. In 1919, the party was dedicated to the "Newsies", boys who sold the daily paper on Lansing streets. Apparently many of the boys were from low-income families and were described by one local reporter as "regular guys with tattered cloths and freckled faces." 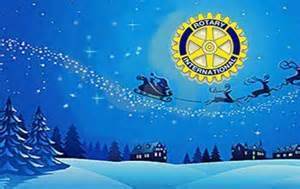 Rotarians considered them special and showed their best holiday spirit, treating the boys to pie and real brown fried cakes, a visit from Santa and such gifts as candy, a magnet and a jackknife. A year later, on Christmas Eve of 1920, 100 underprivileged boys, ages eight to 18, crowded into the banquet hall of the Lansing Chamber of Commerce where Rotarians treated them to a dinner of chicken, turkey, mince pie and many other tasty items. Vaudeville performers from the nearby Bijou Theater provided entertainment and each boy received knitted gloves and a cap, candy, mixed nuts and two bunches of grapes. One of the highlights of the day was the appearance of Santa Claus, skillfully portrayed by Rotarian Winton Bennett, a Lansing dentist. By 1922, Rotary members decided to expand the Christmas party into a more permanent activity - making Christmas cheer last throughout the whole year. Each Rotarian would invite a boy, not his son, to be a special guest at a December luncheon where he would enjoy the club's Christmas activities. But, each would "keep his boy until the time comes when the boy would break into the world to depend on his own resources. The Rotarian would not take over the parental role but provide opportunities the young man might not otherwise have - a ride in the country, a trip to a baseball game or a swim at a park pool." Referred to as the "Boys Auxiliary" it was sort of an early version of today's Big Brother program. Still, even though Rotarians would sometimes direct their Christmas parties at different groups, they didn't forget the boys at the Industrial School. One year, they "passed the hat," raising money so the boys could have a holiday event at the school. By the late 1920's, the Christmas party was being put on for crippled children, supporting the overall work being done by Rotarians in that area. In 1934, members of the Michigan Crippled Children's Commission attended the party at the Hotel Olds. The children received gifts and were entertained by the storytelling of George H. Becker, the steward at the hotel. And later Rotarians remember Louis J. Brand, board chairman of the John Henry Company, who skillfully played Santa Claus for almost 40 years. But, perhaps it is Ted Swift who more than anybody made the holiday event a Lansing institution. Known as "Uncle Ted", Swift appeared before the children explaining why Santa would not be able to appear this year. A natural comedian and actor, Swift kept everyone on their toes or in fits of laughter, singing, dancing and finding other ways he could fill in for the missing Santa. Soon before his death in 1999, Ted Swift talked about his accomplishments in life. "I think I'm a pretty good lawyer," he said. "But I know people will probably remember me for a prank I pulled in law school, for once addressing the Michigan Supreme Court in rhyme and for being Uncle Ted at the Rotary Christmas party. I'm not sure about the first two, but I guess I wouldn't mind people remembering me as Uncle Ted. "You should see those kids' faces. It's something I'll never forget."